The extreme right in Norway is in crisis after Anders B. Breivik’s murderous terror attacks on 22 July with a variety of groups and persons hurrying to disassociate themselves from Breivik and several anti-Muslim websites such as Anti-Jihad Norway shutting down. During first couple of hours after the bomb attack on the government quarter in Oslo, several blogs and websites were almost celebratory in their statements about the alleged naivety of the Norwegian government. Even at 9pm the same evening, after Breivik’s arrest and after it is known that the mass murderer was a white Norwegian, Rustad clung to the hope that the Oslo and Utøya attacks had been committed by Islamists, quoting a ragbag of websites to support this his theory. It was only at 10pm that he finally reported that the police suspected that the terror was homegrown and no part of international terrorism. While Rustad was fretting about the government’s alleged lack of initiative, the situation on the streets of Oslo was extremely tense. Reports have emerged of violence and harassment against people who “looked like” Muslims. Many black or Asian youngsters were subjected comments like “Are you satisfied now”? Indeed someone’s worldview was collapsing, but it was not that of the Norwegian government. Having awaited Islamist terror in Norway and their “day” in the, the extreme right completely lost orientation. Meanwhile, the government stood firm in a situation where most central government buildings were severely damaged and a huge number of its youth organisation’s members were dead or wounded. Unsurprisingly, prime minister Jens Stoltenberg, has harvested enormous sympathy for the calm and disciplined way he handled the crisis. From the instant Breivik’s identity emerged, the police as well as the media started to turn every stone in a hunt for Breivik’s friends on the extreme right. As revealed in a Searchlight press release, Breivik had contact with the English Defence League (EDL), and also its Norwegian offspring, the Norwegian Defence League (NDL). Lena Andreassen, the former leader of the NDL, has claimed in the media that she kicked Breivik out because he was “too extreme”. Question can, however, be asked what Andreassen’s definition of “extreme” is. On her Facebook profile, Andreassen has published pictures of herself, sporting her well-known dark sunglasses and toting a pistol. Andreassen had also uploaded other pictures of firearms, and the people commenting on them left no doubt as to what they mean on certain issues. “Bang, Bang, there goes a muzzie” one of them stated. The same person later claimed that a certain gun was good for vermin control, mentioning Muslims and anti-fascists as possible vermin. One of those commenting on the pictures was Kaspar Birkeland from the western town of Ålesund who claimed that he preferred automatic pistols to revolvers because his wrists got sore from firing revolvers. 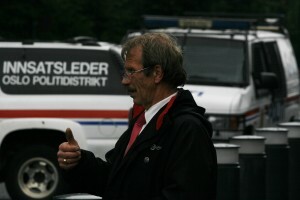 The same Birkeland later had his 15 minutes of national fame when TV2 revealed a recording of a conversation involving him and former NDL leader, Håvar Krane. A shocked TV audience heard Krane state that he was dreaming of putting a Glock pistol to the back of state secretary Jonas Gahr Støres’ head and pull the trigger. Krane fantasised further about blocking the entrances to the government’s Christmas dinner with petrol bombs before killing the cabinet members. Krane, who besides his short lived career as head of the NDL, has been active in the SIAN (Stom Islamisation of Norway) and is also a mayoral candidate from the Democrats, a splinter group from the populist Progress Party (FrP), in Kristiansund. Shortly after being exposed, Krane withdrew his candidacy, while Birkeland, though obviously present when the conversation took place, denied hearing anything at all. After a police and press hunt one of Breivik’s key political mentors, internationally known as the blogger Fjordman, had to reveal his identity to the public. Peder Jensen was hardly the Nordic warrior his fellow counter-jihadists believed him to be, but an unassuming 36-year-old who wrote his Masters degree dissertation on censorship and blogging in Iran. Jensen has been assisting the police, who confiscated his computer. Using civil war rhetoric, Jensen has on several occasions urged people to arm themselves for the future, claiming that Western governments have failed to protect their citizens. Jensen/Fjordman has had great impact on the anti-Muslim blogosphere on the Internet, promoting conspiracy theory about “Eurabia”, which claims that the elite of Europe is handing the continent over to the Arab world. Because he has been branded as Breivik’s political inspiration, Jensen has lost some of his popularity among his followers, and a lot of people have been trying to disassociate themselves from him. Among those who admit to having actually met Jensen are Hege Storhaug and Rita Carlsen from the state funded anti-Islamic “Human Rights Service”. The only things they seem to have noted about him was that he had disturbing opinions and believed in conspiracy theories. The conspiracy theory in question is the very same idea of “Eurabia” – as Searchlight’s friends at the online anti-fascist journal Vepsen have carefully documented – that the Human Rights Service has been eagerly promoting on its own website. Hans Rustad of Document.no also admits to have met Jensen at a meeting in Copenhagen but claims that he did not know that Jensen was Fjordman. While the extreme rightists are frantically trying to tear themselves loose from the political mast they are nailed to, the rest of the Norwegian society is slowly returning to a more normal life, debating how the public debate should be conducted after the horrors of 22 July.